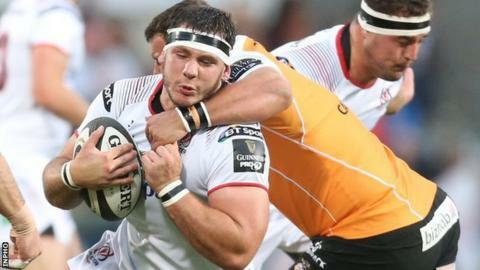 Ulster flanker Marcell Coetzee is to return to South Africa to seek medical opinion on the knee injury which has blighted his time at Kingspan Stadium. Coetzee suffered ACL damage in April 2016, two months after signing for Ulster, and did not make his debut until February 2017 against Edinburgh. He played four games last season and started against the Cheetahs last month before suffering this latest setback. He will now return to the surgeon who performed his surgery in South Africa. Ulster Rugby confirmed Coetzee "suffered a recurrence of left knee pain and swelling in training". They added: "Due to the ongoing problems with this knee, he is travelling back to South Africa to seek the opinion of the surgeon who performed his original ACL repair." Coetzee, 26, earned a reputation as a robust ball-carrier during his career with the Sharks in South Africa and has been impressive in the limited appearances he has made for Ulster. He played four times last spring, against Edinburgh, Glasgow, Zebre and Treviso, before suffering another season-ending knee problem. Hopes of Coetzee forging a formidable back-row partnership with fellow South African Jean Deysel were boosted when they sparkled together in the Pro14 season opener against the Cheetahs in September, before injury struck again. It is not clear when Ulster fans will see the player back on the pitch. His contract at Ulster runs until the end of the 2018-19 season.